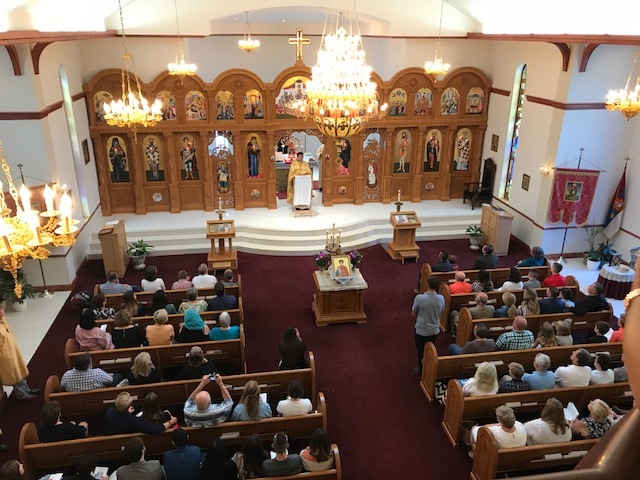 On Sunday, July 29, 2018 the St. George Serbian Orthodox Church, Lenexa (Kansas City), KS, honored Protojerej-Stavrofor Fr. Aleksandar Bugarin and his family with an appreciation luncheon in recognition of 24 years of service to the parish. Proto Aleksandar recently accepted reassignment to become the new parish priest at St. George Church in Joliet, IL effective August 1st. The day, July 29th, is a special one in the life of Bugarin family, and the parish, as it was in 1994 when then Fr. Deacon Aleksandar and his wife, Popadija Gordana, first came to Kansas City. Proto Aleksandar was born October 4, 1968 in Pacir, Vojvodina and grew up around Novi Sad. The son of a Serbian Orthodox priest, Aleksandar knew he wanted to follow in his father’s footsteps and pursue the priesthood. He came to the United States in 1989 to attend the newly opened School of Theology at the St. Sava Serbian Orthodox Monastery in Libertyville, IL. He participated in many aspects of seminary life and worked his way through school graduating with his Bachelor of Theology degree in 1992. During this time he met his future wife, Gordana nee Markovic of Racine, WI and the two were married in May of 1994 at St. Sava Monastery. In July of that same year, Aleksandar was ordained to the Holy Diaconate by His Eminence Metropolitan Christopher. The S.S.S. St. George Choir traveled to Libertyville from Kansas City to sing responses for his ordination. From July to November 1994, Fr. Deacon Aleksandar served the Kansas City parish as its official parish deacon. In November of that year, he was ordained to the Holy Priesthood by His Eminence Metropolitan Christopher in St. George Church. Father Aleksandar officially took over as parish priest from the then retiring Protojerej-Stavrofor Fr. Milan Bajich in January 1995. From the start of his ministry in Kansas City, Father Aleksandar tirelessly worked for the betterment of the parish. He renewed Serbian language classes for adults, cultural programs for the youth, started the publication of the Glasnik, the parish newsletter, and organizes a yearly pilgrimage trip to Serbia and Lika. The pilgrimage trip centers on some of the most holy sites and monasteries in Serbia. Additionally, participants are taken to see their family villages in mostly the Lika region where the original families that settled the Kansas City parish came from. It is because of Father Aleksandar’s detailed research and love of history that many of the American born parishioners of Serbian descent learned where their families had originated. In 2002, Father Aleksandar would receive his first priest elevation with the rite to wear the Red Sash from His Eminence Metropolitan Christopher. The year 2006 marked a major milestone in the life of the Kansas City parish. The congregation celebrated its 100th Anniversary and consecrated its new church in Lenexa. Father Aleksandar worked diligently with the church’s building committee during the planning and construction of the new church. At the Divine Liturgy celebrated the day of the consecration, Father Aleksandar received his next priest elevation to Protojerej by His Eminence Metropolitan Christopher. Over the next several years Proto Aleksandar would take on additional rolls within the New Gracanica-Midwestern Diocese. He was instrumental in helping to form the first Serbian Orthodox Church in the state of Iowa. In 2013 the newly purchased and converted church in Des Moines dedicated to St. Demetrius was consecrated by His Grace Bishop Longin. It was at this church consecration that he would receive his last priest elevation of Protojerej-Stavrofor with the rite to wear the Pectoral Cross. He would continue to administer to the Des Moines parish monthly until they received their first full time priest. He has also at times administered to St. Archangel Michael Church in Kansas City and All Saints Church in Sioux Falls. Additionally for the diocese, Proto Aleksandar was appointed and served as Dean for the St. Louis Deanery. Support was also given to the betterment of the Greater Pan-Orthodox community in Kansas City. He served as President of the Kansas City Orthodox Clergy Brotherhood, supported programs at Reconciliation Services attached to St. Mary of Egypt Church, and participated in the Eastern Orthodox Youth Camp (EOYC) every year since 1995. Service to others has always been important to Proto Aleksandar. Because of this, he completed 400 hours (first unit) of the Clinical Pastoral Education Program at Research Hospital in Kansas City, MO and served as a chaplain at both Research and Menorah Hospitals. Additionally during his time in Kansas City, he and Protinica Gordana were blessed with their three beautiful children: Jelena, Stevan and Kristijana. Each of his children along with Protinica Gordana have helped in numerous ways assisting and working the various fundraisers and activities of the church and its organizations. The special day of Sunday, July 29, 2018 began with the celebration of Divine Liturgy. The Lenexa church was filled with many parishioners who came to support and offer their appreciation to Proto Aleksandar and his family at this his last liturgy as their parish priest. Additionally, several parishioners came from the Serbian parish in Des Moines and the counselors of the Pan-Orthodox EOYC camp came as well. At the end of liturgy, Proto Aleksandar read a very touching thank you message he had written on behalf of his family to the parish. When he finished, the S.S.S. St. George Choir sang an emotional Mnogaja Leta for him and his family. The appreciation luncheon began shortly after liturgy and was provided by various ladies of the parish. Words of appreciation were offered officially by Paul Bajich, church board president; Brad Hijaz, choir president; Miryana Cubric, Kolo representative; and Stephen Lemley, Lodge president. Many beautiful gifts were also presented to Proto Aleksandar and his family by the church board, church in Des Moines, EOYC camp, and church organizations. The gifts included a blessing cross, new black briefcase for home blessings/visiting the sick, hand carved wood icon of St. Vasilije of Ostrog and silver plated icon of Christ. At the conclusion of the luncheon many people formed a line to say thank you and take pictures with the Bugarin family. The day marked an end to 24 years of dedicated service in Kansas City by Proto Aleksandar and his family. The St. George Church wishes them well in Joliet and it is our hope that they will always and forever consider Kansas City home! Proto Aleksandar is being replaced by Rev. Fr. 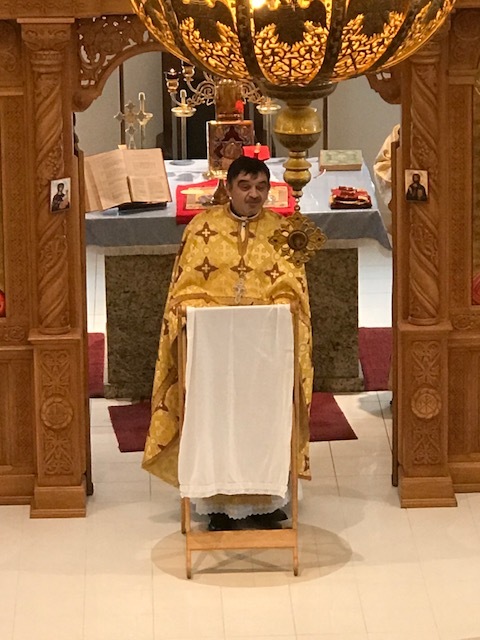 Radomir Plavsic who has been serving as the parish priest at St. Vasilije of Ostrog Serbian Orthodox Church in Chisholm, MN. He will assume official priest duties September 1st in Kansas City.